The MxxxT Series Ethernet Remote I/O Module is an industrial class, isolated designed, high reliability, high stability and high precision data acquisition module, embedded 32-Bit High Performance Microprocessor MCU, Integrated 1 Industrial 10/100M adaptive Ethernet module inside. 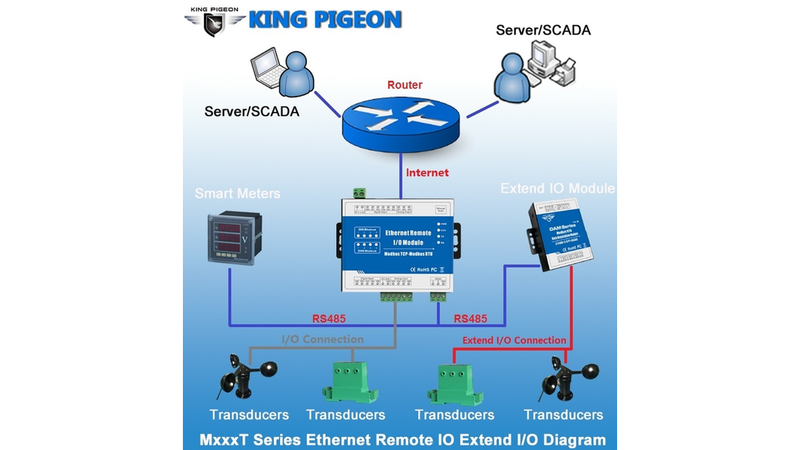 It provides multi I/O, supports standard Modbus TCP, can be intergraded into SCADA, OPC server, and other automation systems. It is design for working in the harsh industrial application environment, widely used in a variety of industrial automation. The MxxxT Series Ethernet Remote I/O Module includes different IO modules, Supports Modbus TCP over Ethernet, and can extend additional I/O modules via RS485, Supports registers mapping function. The Ethernet Remote IO module performs Modbus TCP Server and Modbus Master.